John Leonard of UMass makes a nifty move on Notre Dame goaltender Cale Morris to score his second-period goal. MANCHESTER, N.H. — Hockey in April. This is what the UMass hockey team was fantasizing about two seasons ago when the Minutemen lost 29 games, when they were everyone’s favorite opponent. Now, they’re two victories away from their first national championship. “UMass in the Frozen Four? Somebody probably thought they’d see Bigfoot before that happened,” mused coach Greg Carvel after his Minutemen (30-9-0) throttled Notre Dame (23-14-3), 4-0, on Saturday night to win the Northeast Regional before 5,679 at SNHU Arena. The Minutemen advance to next month’s Frozen Four in Buffalo, where they’ll meet Denver, a 3-0 winner over AIC in the West Regional. It will be the Pioneers’ 16th Frozen Four appearance and the first since winning it all in 2017. 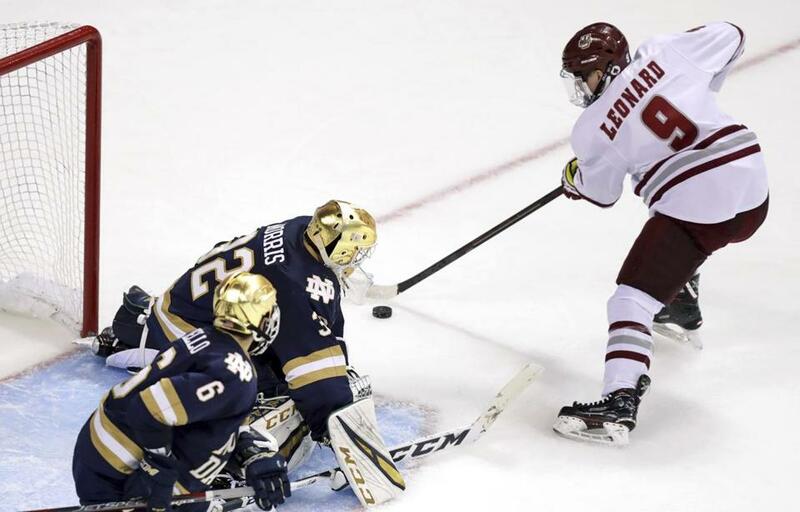 Notre Dame, which was making its 11th appearance in the NCAA tournament, has been where UMass has dreamed of being, having reached the Frozen Four four times and the championship game twice. But they were no match for a Minuteman varsity that beat Harvard here by the same count and became the first team since Boston College in 2012 to advance to the Frozen Four without allowing a goal. When the Minutemen were stuffed by the Eagles in the Hockey East semifinals at TD Garden, they looked like a bunch of wide-eyed kids who weren’t ready for the big stage and might not survive a one-and-done in a challenging regional. This was the UMass varsity that had been at the top of the national rankings all year, that had claimed the conference regular-season crown after winning only five games two years ago. They played as though they were a man up for 120 minutes and when the chance came to throw a knockout punch, they did it on both nights. “We were a buzzsaw this weekend,” Carvel said. Notre Dame, which had to come from behind twice to beat Clarkson, 3-2, in overtime, never got going. UMass, fresher and faster, came hard at the Irish in the first period and had a dozen chances but couldn’t crack goalie Cale Morris (30 saves). But once UMass broke through in the second it was with a wallop that staggered the Irish, with the Minutemen scoring three goals within seven minutes. The first goal at 7:49 came on their potent power play with Jake Gaudet whipping a wrister to the far post from the right circle after the puck had bounced off an official on a cross-ice pass. The second, at 10:32, came on a rebound by Amherst native John Leonard, who was all alone in front after Brett Boeing’s shot with ample time to deke Morris and flip the puck past him. The knockout punch at 14:49 came from defenseman Cale Makar, who blasted an unstoppable, if not unseeable, slapper from the top of the left circle. By the period’s end UMass had outshot Notre Dame by a 28-8 margin. Since the Minutemen were 22-0 this season when leading after two periods, they might as well have booked tickets to Buffalo. Goalie Filip Lindberg, who needed to make only 13 saves, probably could have lashed a piece of five-hole plywood to the cage and headed back to the hotel.